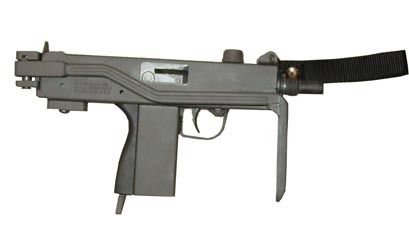 When I first got my M-11/NINE I was weary of the factory collapsible stock included with the gun. I had heard horror stories about them collapsing on shooters while firing the gun in Full-Auto. After fiddling around with the factory stock for a bit I could see how this could easily happen so I went shopping for a replacement stock. I wanted some thing that look liked it belonged on the gun but was functionally sound enough that I would not run into any safety issues. Practical Solutions had the perfect stock for me, their “UZI style” side folding stock for the M-11/NINE not only looks like it belongs on the M-11 but functions great. The stock was on my doorstep a few days after I placed my order because Practical Solutions uses 2-3 day priority shipping. The shipping box was unremarkable from the outside, which is a good thing since you don’t want post office employees with sticky hands to get some thing for free. The product was well protected because it was enveloped by plenty of packing peanuts and contained in its own sealed bag. The stock came with all the hardware necessary for mounting. On mine however I wanted to keep my “stock mounting block” on the bottom for other accessories, so keep in mind that large block on the end of my gun is not part of the stock but some thing else. The finish on the stock matches my M-11/NINE perfectly. The stock and mounting hardware appear to be of quality construction and not likely to fail. 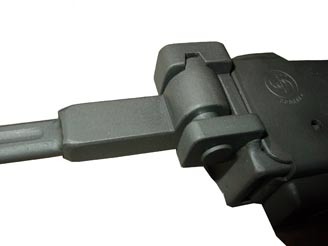 This stock also allows the shooter to use the factory sites and does not interfere while operating the gun. The things I disliked about the stock is that you cannot open it fast enough in a tactical situation, and with some of the new uppers coming out it wont close all the way. This really doesn’t matter though because the only tactical situation my gun will see is putting holes in old phone books, and it wasn’t designed for those uppers in the first place. Overall the practical solutions stock is a great addition to your M-11/NINE if you are looking for a quality stop that won’t make your gun look “bubbafied”. Approx $130.00 US Is an alternative to the unsafe factory stock.